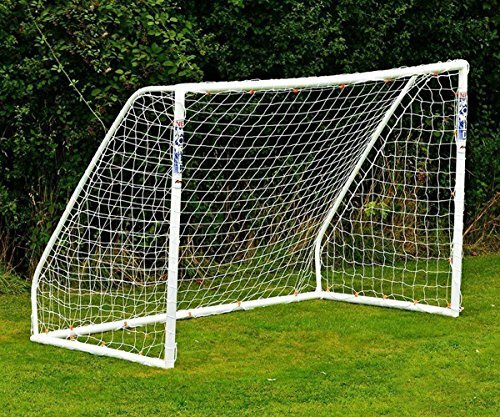 This is a perfect soccer net for replacement, polyethylene material, standard size, suitable for outdoor use. 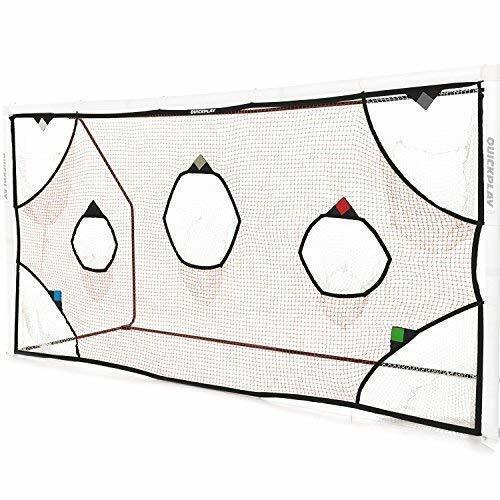 QuickPlay PRO Soccer Goal Target Nets with 7 Scoring Zones Practice Shooting & Goal Shots.Soccer Goal Frame not Included. The QUICKPLAY PRO SOCCER TARGET NET - is an essential coaching tool to develop soccer player's shooting and passing accuracy. It features 7 changeable pocket target zones to keep soccer drills fresh. Suitable for individual and team training. *Soccer goal frame not included. MOVE THE VELCRO COLORED MARKERS - QUICKPLAY's color coded system keeps training drills fresh and player's visual acuity sharp. With this training target players won't get bored like they do with other soccer target nets. Simply move the colored markers from target to target to create fun and varied training games. 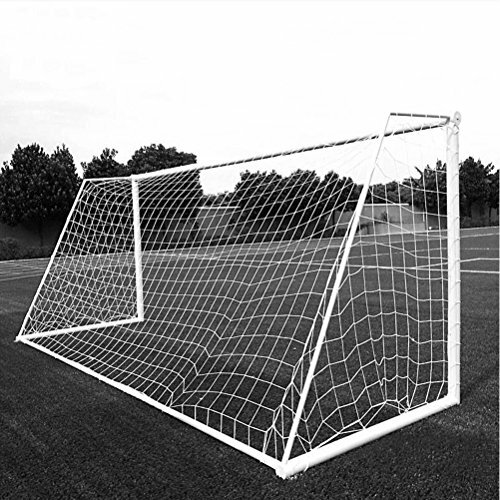 Patent pending GOAL POSTS NOT INCLUDED - The Target Net 16x7' is a premium coaching net and the perfect accessory to the QUICKPLAY 16x7' MATCH-FOLD GOAL. Additionally it's designed to fit any properly sized solid frame soccer goal of an equivalent size. QUICK & EASY TO SET-UP - The net features QUICKPLAY's quick and easy unique shock absorbing bungee attachments for longer net life. The bungees attach the net to any goal. QUALITY & DURABILITY - Designed in the UK by soccer players, for soccer players and used by professional soccer clubs, schools and colleges around the world. The QUICKPLAY PRO SOCCER TARGET NET - is an essential coaching tool to develop soccer player's shooting and passing accuracy. It features 7 changeable pocket target zones to keep soccer drills fresh. Suitable for individual and team training. *Soccer goal frame not included. 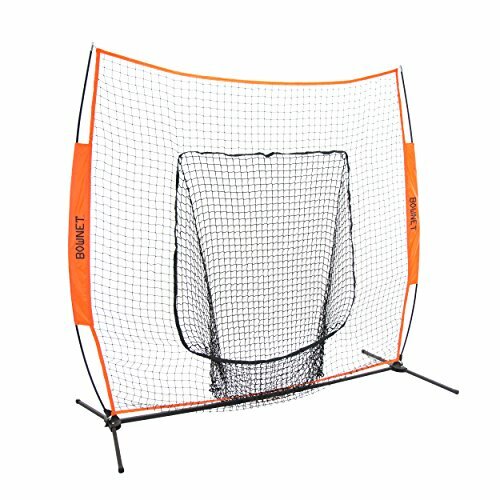 GOAL POSTS NOT INCLUDED - The Target Net is a premium coaching net and the perfect accessory to the QUICKPLAY Match-Fold Goal. Additionally it's designed to fit any properly sized solid frame soccer goal of an equivalent size. QUICK & EASY TO SET-UP - The net features QUICKPLAY's quick and easy unique shock absorbing bungee attachments for longer net life. The bungees attach the net to any goal. QUALITY & DURABILITY - Designed in the UK by soccer players, for soccer players and used by professional soccer clubs, schools and colleges around the world. Attention: this net is made of PE (polyethylene) ,not PP (Polypropylene). Material: Polyethylene Twine, PE (polyethylene) smells well, non-toxic, chemically stable and better of anti-aging. Heavy duty with longer Service life than PP(Polypropylen). Net edge hemmed for long time usage without coming apart.High impact, flexible, light and easy to assemble. 120mm Sq. 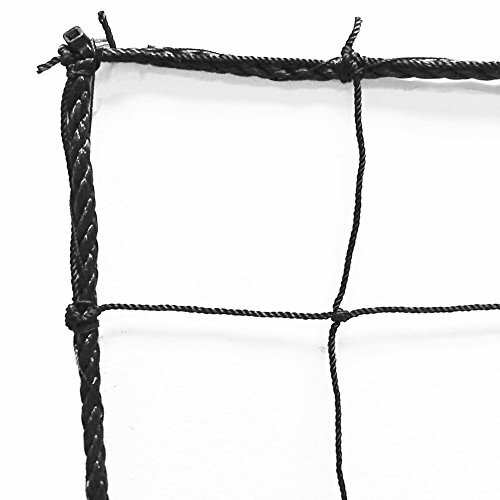 Mesh, 2.5mm twisted twine, Note: soccer goal and poles NOT included. US Domestic Shipping, Return and Money Back Guaranteed. Please DO contact us no matter what you may encounter through the complete order. Designed for training, scrimmages or games. Simply carefully unstrap velcro and allow to unfold then peg it down through pegs for hours of soccer training fun. Lightweight and portable, can be taken anywhere, like soccer camps, beach, lawn, park, backyard. Package includes: 2 goals, 8 pegs, 4 cones, 1 carrying bag. Dimension: 47.2" x 31.5" x 31.5". Package includes: 2 goals, 1 soccer, 8 pegs, 6 cones, 1 pump, 1 carrying bag. Dimension: 71" x 40" x 40". * Do not set it on concrete or other jagged and hard surface, they may tear the material around the frame. It is advisable to set it up only on soft surface like grass or sand. * We suggest you perfect the folding technique. After 2-3 attempts, you will be able to assemble and fold your goal away in seconds. * The goal will break if not folded properly, please read the folding instructions careful in order to fold the goal properly. Durable & well-made -- Made from reinforced oxford fabric & net, high tensile frame, stronger and longer PVC pegs. No assembly required, take from the carrying bag, unfold to open then peg it down through pegs to securely keep the goal in the ground. Twist flat and put into the carrying cag for easy storage and transport, don't occupy much space. For players & teams of all ages and skill level, use the soccer nets for backyard, field training or take them to the beach. 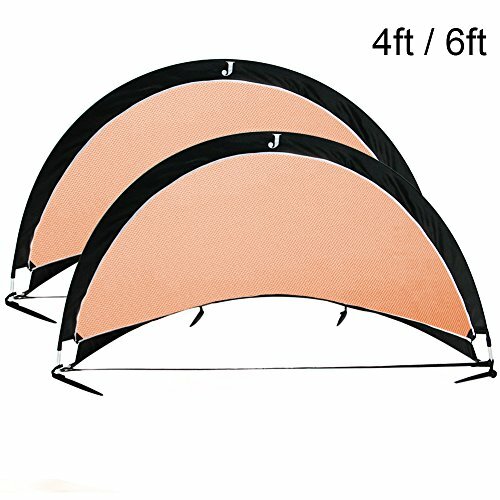 4 ft pop up soccer goal -- Package includes: 2 goals, 8 pegs, 4 cones, 1 carrying bag. Dimension: 47.2 x 31.5 x 31.5. 6 ft pop up soccer goal -- Package includes: 2 goals, 1 soccer, 8 pegs, 6 cones, 1 pump, 1 carrying bag. Dimension: 71 x 40 x 40. 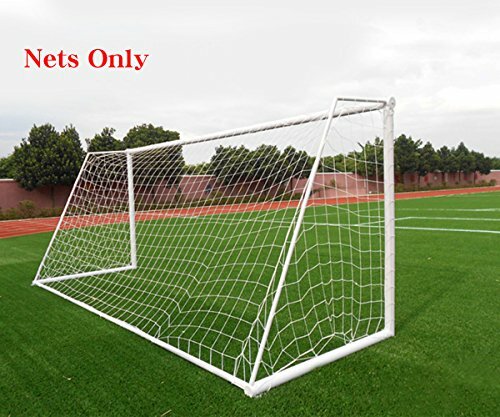 This is a perfect soccer net for replacement, polyester material, standard size, suitable for outdoor use. Attention pls: this net is made of PE (polyethylene) ,not PP (Polypropylene). If you spend more time in the neighbours backyard retrieving your ball than you do playing sports, you need the new Stop That Ball system! 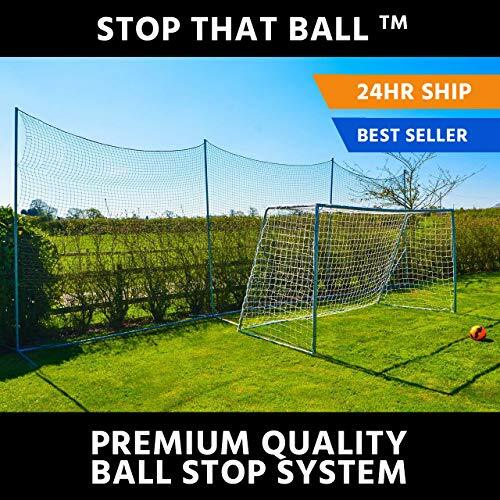 Stop That Ball is designed especially for backyards, to stop a wide range of different sports balls from flying over in to neighbours backyards. Simple to assemble and is up and in place in no time at all! Stop That Ball can be left standing all year round, through all weather conditions but if you choose to take it down it is very easy to store safely. - The modular designed allows you to extend the system to any length. - The frame is made from super strong steel poles, which are 100% rust proof meaning the system can be left up outdoors. - Can be used to contain almost all sports balls including soccer balls, baseballs, basketballs, and many more! - Recommendation - We recommend that the bases are pegged down. In windy conditions we would suggest using additional anchor pegs. In stormy conditions we recommend that system is rested flat. BACKYARD BALL STOP SYSTEM - The freestanding design of this ball stop net and post system makes it perfect for use in backyards. At 10ft tall, the ball stop system will protect your surroundings from damage. FIVE WIDTHS TO CHOOSE FROM - Get the perfect ball stop net for the size of your backyard by choosing between the five width options. There are 10ft, 20ft, 30ft, 40ft or 50ft ball stops to choose from. EXTENDABLE BALL STOP NETS - Designed with an inventive extender unit, the cutting-edge backyard ball stop net system allows the angle to be altered every 10ft, providing a fully customizable ball stop system. WEATHERPROOF STEEL FRAME - The sturdy manufacturing of this freestanding ball stop net and post system makes it perfect for year-round use. The 34mm zinc plated steel frame has a powder coated finish for rust-protection. 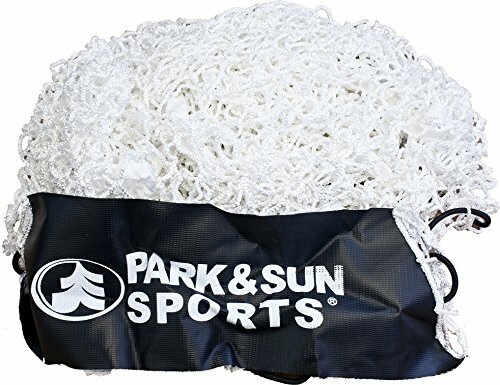 STRONG BALL STOP NET - For reliable ball stopping performance, the 48mm square mesh netting has been manufactured from 3mm knotless polypropylene twine for high levels of durability and long-lasting performance. 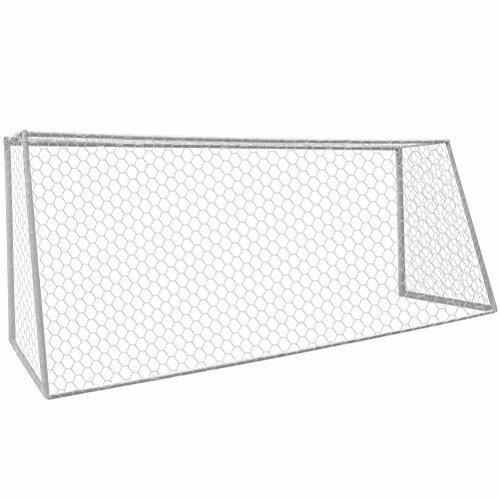 JFN Soccer Backstop/Barrier Net is roughly 2.5mm in thickness and is commonly used behind soccer goal nets or around fields to keep balls within the fields or backyards. All nets are UV and weather treated and have a tar finish for extra protection and durability. These nets are made to withstand the weather and will last 3-5yrs left outdoors. All nets are hand made in the USA and are made to order. Reinforced with a 5/16 rope border along perimeter. All orders are cut and made to order in the USA. 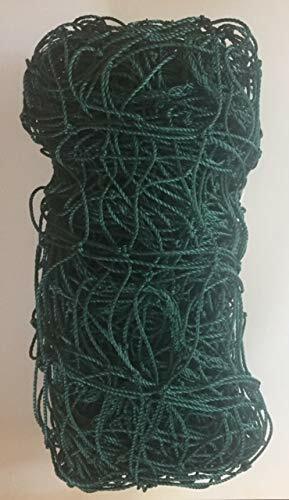 This 12' x 6' Replacement net for FoldFast's Green Goal for Soccer is a sturdy dark green 60-ply twisted PE 4" mesh that allows your Green Goal to blend with the scenery. Fits most brands 12' x 6' soccer goals.